Shine is great on silver and gold but not so much on your portrait subjects face. It is not too difficult to fix oily skin in Photoshop. 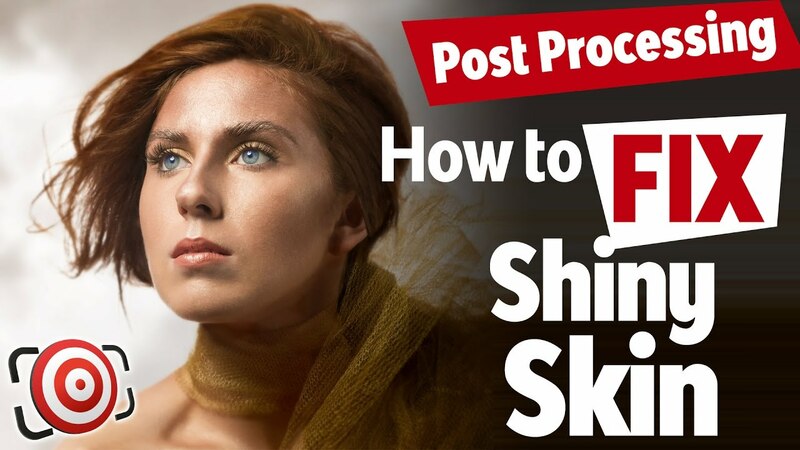 Stay tuned and I’ll show you a super quick retouching tip to eliminate shiny skin or oily skin in both Photoshop and Lightroom. It’s summer time… you shoot a wedding or an outdoor portrait and because of the heat your subject has shiny skin or your new to lighting and haven’t quite perfected things yet and you have a great shot – but your subjects skin is shiny – it’s easy to fix in post-production. A few quick reminders… FIX it in post is NEVER the best solution – so as you are practicing and learning your craft – ALWAYS strive to get it right in camera. Also – if you are doing portraits or headshots or modeling shots and you want to up your game – lighting is just a piece of the puzzle – you need to find a great makeup artist to get your images to a pro level. Here is a great portrait that was posted in my Facebook group by Stig-Arve Holmem from Norway. We have a very young subject with lots of personality but no makeup artist and the image is just slightly over exposed, so we wind up with shiny skin in the forehead, nose and tops of the cheeks. So do we scrap the image? Heck no – it’s a great shot and easily repaired. SUBSCRIBE so that you don’t miss NEW VIDEOS! Neat trick. Works really well. Thank you. Wow this was dope. I love this tutorial! Thanks Joe! One question – you mentioned "new to lighting" and getting it right in camera. Do you have a video that talks about how to avoid these shiny spots when using lighting? YouTube really needs to improve how to find videos as the volume grows! Thanks so much for this! This was very very helpful. Very helpful and effective. Thank you. Another very useful tip…thank you! Equally manageable in Affinity Photo or, even better, GIMP for those without the budget or inclination to pay a subscription. All I can say is simple steps that worked great. Thank you. You are by far the best! Your videos and way of talking is fab.. Your in-depth knowledge depicts your hard work over the time … Really a fan of your work and dedication. … I wish I could become even 1 % of what you're. Thank you – so helpful! Sorted out one of my photos in seconds. Damn, even if one knows the tools, doesn't mean he can use it creatively. this is so much win! I had ran into this issue, maybe 10 minutes ago? and here comes youtube to save the day by recommending a video that would help me fix the extra bright spots on my subject's face. Thanks again for the super informative videos! you rock! Thanks Joe. Your step by step instruction is very easy to follow. Fantastic instructional video. Easy to follow and understand. One of the best I've seen. Yes, I liked and subscribed. Thank you!